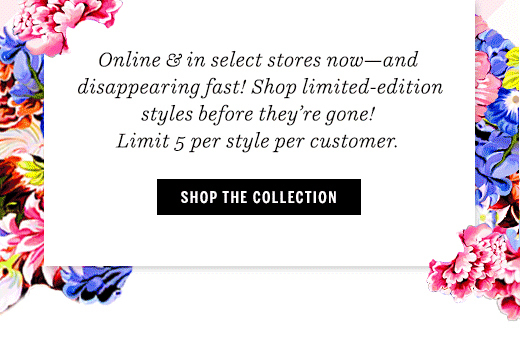 TO REDEEM OFFER: Add qualifying in-stock items totaling $85 or more and robe (search ROBEVS for styles) to your shopping bag. Enter offer code ROBEVS at checkout. The cost of your robe will be adjusted after code is applied (one free robe per order). Valid December 6, 2018 through December 10, 2018 at 11:59pm PT; while supplies last. OFFER EXCLUDES THE FOLLOWING: PINK, Beauty, clearance (items with prices ending in $.99), gift cards, previous and store purchases. Not valid with any other promotional gifts with purchase. ADDITIONAL OFFER DETAILS: No substitutions. Discount cannot be redeemed for cash or used as payment toward your Victoria’s Secret Angel Credit Card. Offer subject to adjustment due to returns, cancellations and exchanges. Orders shipping outside the US may not be eligible; additional taxes and duties may apply. Offer may be modified or discontinued at any time without notice. TO REDEEM OFFER: Add two or more qualifying sleep separates from the ‘Limited Time! 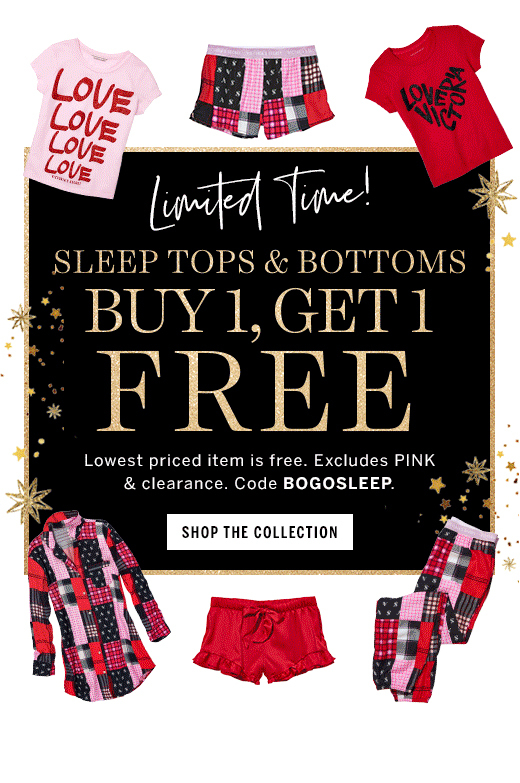 Sleep Tops & Bottoms Buy 1, Get 1 Free’ collection to your shopping bag. Enter offer code BOGOSLEEP at checkout. The price of your lowest-priced sleep separates will be adjusted after offer code is applied (discount applied to qualifying items purchased in multiples of 2). Valid December 4, 2018 through December 7, 2018 at 11:59pm PT; while supplies last. OFFER EXCLUDES THE FOLLOWING: PINK, clearance (items with prices ending in $.99) does not qualify toward offer eligibility. Not valid on previous purchases or store purchases or with other sleep offers. ADDITIONAL OFFER DETAILS: No substitutions. Offer subject to adjustment due to returns, cancellations and exchanges. Orders shipping outside the US may not be eligible; additional taxes and duties may apply. Offer may be modified or discontinued at any time without notice. 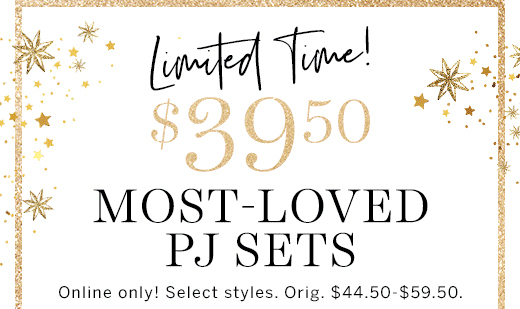 TO REDEEM OFFER: Add qualifying in-stock PJ set and Slippers from the “Limited Time: Free Slipper Offer” collection to your shopping bag. Enter offer code PJBONUS at checkout. The price of your slippers will be adjusted after offer code is applied (one free pair of slippers per PJ set purchased). 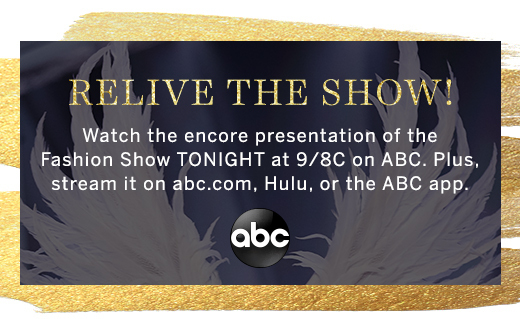 Valid December 2, 2018 at 10:00 pm ET through December 7, 2018 at 11:59pm PT; while supplies last. OFFER EXCLUDES THE FOLLOWING: PINK, clearance (items with prices ending in $.99), gift cards, gift wrap & kits, store and previous purchases do not qualify toward offer eligibility. Not valid with select other sleep offers. ADDITIONAL OFFER DETAILS: No substitutions. Offer subject to adjustment due to returns, cancellations and exchanges. Orders shipping outside the US may not be eligible; additional taxes and duties may apply. Offer may be modified or discontinued at any time without notice. 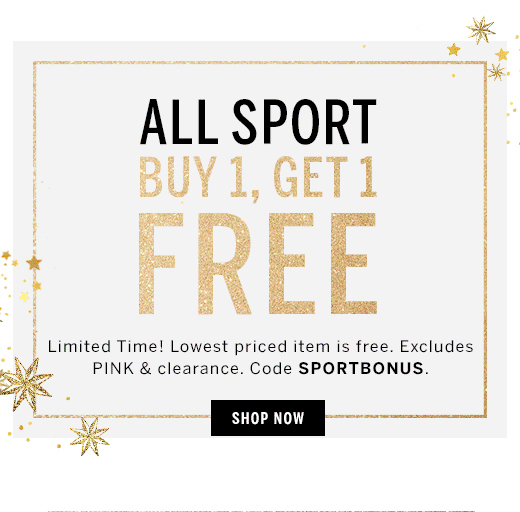 TO REDEEM OFFER: Add two qualifying in-stock Sport items from the "Limited Time! All Sport Buy 1, Get 1 Free" collection to your shopping bag. Enter offer code SPORTBONUS at checkout. The price of your lowest-priced Sport item(s) will be adjusted after offer code is applied (discount applied to qualifying items purchased in multiples of 2). Valid December 1, 2018 through December 7, 2018 at 11:59 pm PT; while supplies last. OFFER EXCLUDES THE FOLLOWING: PINK, clearance (items with prices ending in $.99) and gift cards do not qualify toward offer eligibility. Not valid on previous purchases or store purchases or with other sport offers. ADDITIONAL OFFER DETAILS: No substitutions. Offer subject to adjustment due to returns, cancellations and exchanges. Orders shipping outside the US may not be eligible; additional taxes and duties may apply. Offer may be modified or discontinued at any time without notice. TO REDEEM OFFER: Add two qualifying items from the ‘Limited Time: Buy 1 Get 1 Free Gift offer’ collection to your shopping bag. Enter offer code GET1FREE at checkout. The price of your lowest-priced beauty, accessories, or cold weather item(s) will be adjusted after offer code is applied (discount applied to qualifying items purchased in multiples of 2). Valid November 27, 2018 through December 7, 2018 at 11:59 pm PT; while supplies last. 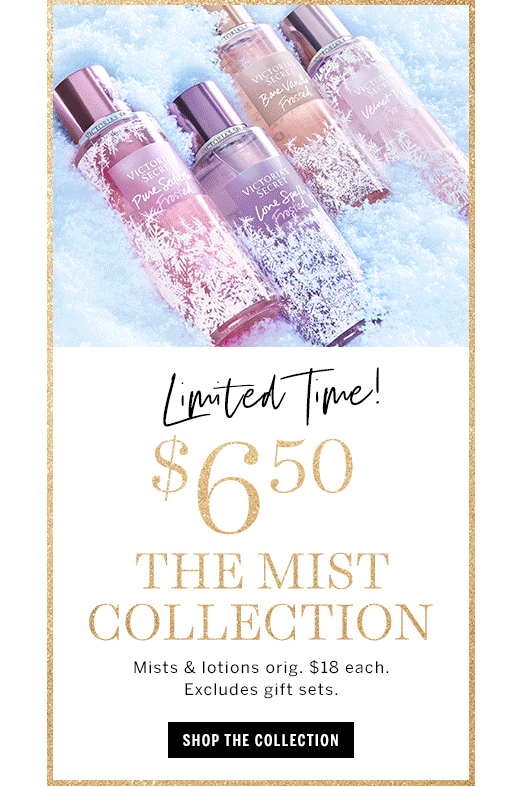 OFFER EXCLUDES THE FOLLOWING: PINK, The Mist Collection, 1.0 oz Eau de Parfums, clearance (items with prices ending in $.99) and gift cards do not qualify toward offer eligibility. Not valid on previous purchases or store purchases or with other beauty offers. ADDITIONAL OFFER DETAILS: No substitutions. Offer subject to adjustment due to returns, cancellations and exchanges. Orders shipping outside the US may not be eligible; additional taxes and duties may apply. Offer may be modified or discontinued at any time without notice.